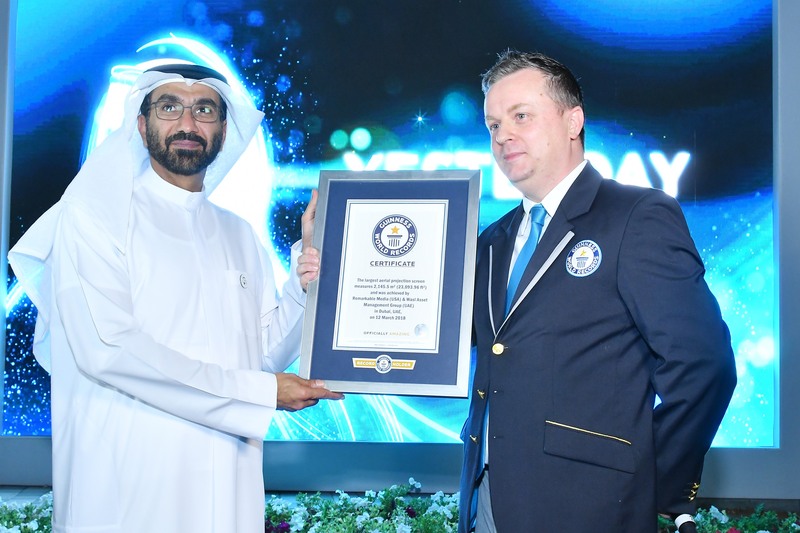 The event was attended by a large audience from across Dubai, as well as Guinness World Records representatives who were present to document the achievement. 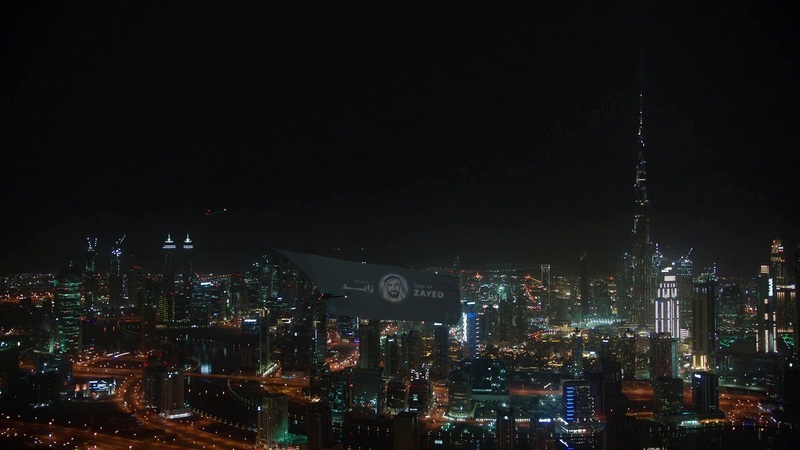 This new world record, which was set by wasl Asset Management Group, saw a 300-foot aerial screen soar across Dubai’s iconic skyline towed by a Bell 212 Helicopter, while a second Bell 212 projected the video onto the screen, using a combination of augmented reality tracking and live projection mapping, displaying a short film about ‘Year of Zayed’, and providing the public with an impressive visual tribute to the Founding Father’s life and values. 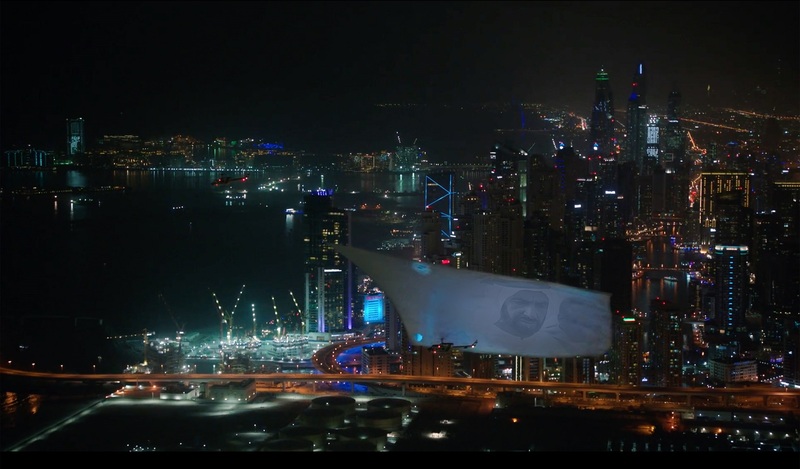 The screen could be viewed from up to 3 kilometers away and had started its journey from Skydive Dubai before flying over the Dubai Coast and then inland to reach Zabeel Park passing over wasl’s latest project wasl1. The helicopters then hovered over Dubai Creek and back out to the coast landing back at Skydive Dubai after a flight duration of approximately 90 minutes. His Excellency Hesham Al Qassim, CEO of wasl Asset Management Group, commented: “We are delighted to have celebrated the ‘Year of Zayed 2018’ in a memorable and ambitious way that captures the late Founding Father’s pioneering spirit and strengthens Dubai’s reputation as a leader in achieving world firsts. Talal Omar, Country Manager of Guinness World Records MENA, added: “Dubai has set the stage for numerous record-breaking successes over the years and we are delighted to be part of the celebrations of another new GUINNESS WORLD RECORDS title by wasl Asset Management Group. It’s always great to see how the UAE celebrates its nation’s pride through continuous record-breaking events, and this initiative definitely stands out. 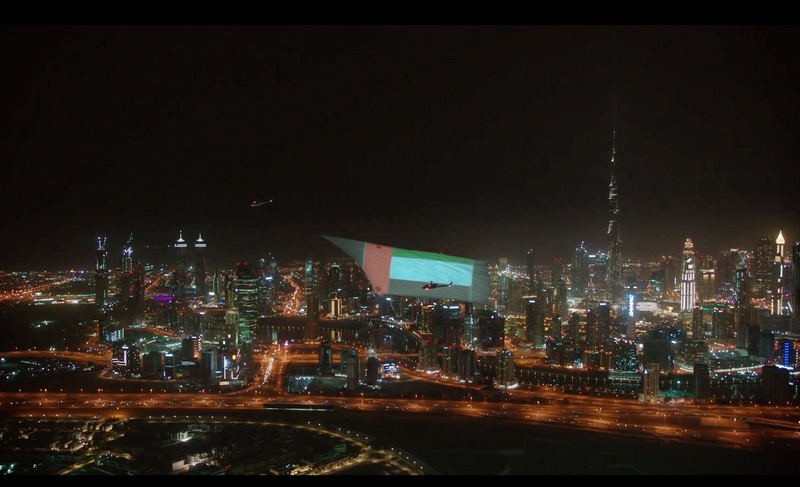 On the ground, huge display screens were set up at ‘dar wasl’ and ‘wasl1’ projects so that the audience could watch the screen’s 90-minute journey live on the air as it soared in the Dubai skies. This achievement has only ever been accomplished once before in New York City, when the record was originally set by a 250 foot screen. Dubai’s 300-foot screen beat the previous record by 50 feet.